This article is about the historic Dublin city government organisation. For the current city administration, see Dublin City Council. Dublin Corporation (Irish: Bardas Bhaile Átha Cliath), known by generations of Dubliners simply as The Corpo, is the former name given to the city government and its administrative organisation in Dublin between 1661 and 1 January 2002. It is now known as Dublin City Council. 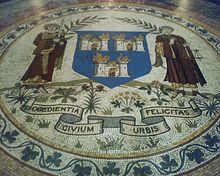 The Coat of Arms and motto of Dublin Corporation, from a floor mosaic in City Hall. The arms underwent numerous revisions but always featured the original 13th-century image of three burning castles on its shield. The long form of its name was The Lord Mayor, Aldermen and Burgesses of the City of Dublin. Dublin Corporation first came into being under the Anglo-Normans in Dublin in the late 13th century. For centuries it was a two-chamber body, made up of an upper house of 24 aldermen, who elected a mayor from their number, and a lower house, known as the "sheriffs and commons", consisting the 48 sheriff's peers and 96 representatives of guilds. The modern Dublin Corporation was restructured by late 19th-century and 20th-century legislation, particularly, the Municipal Corporations (Ireland) Act 1840, with the elected body reduced to a single chamber Dublin City Council, presided over by the Lord Mayor of Dublin, an office first instituted but not filled by King Charles I and reconstituted following the Restoration of the Crown by King Charles II. A later monarch, Queen Victoria, refused to visit Ireland for a number of years, partly in protest at Dublin Corporation's decision not to congratulate her son, Prince Albert Edward, The Prince of Wales, on both his marriage to Princess Alexandra of Denmark and on the birth of the royal couple's oldest son, Prince Albert Victor. On 1 January 2002, following a major reform of local government which also abolished the 300-year-old title of Alderman in the Republic of Ireland and 700-year-old title of 'town clerk' in Dublin, the name of Dublin Corporation was abolished, with the 19th-century name Dublin City Council, which previously had been used simply to refer to the assembly of elected councillors, being given to the entire administration.